This photo of me outside the Interop conference at the Mandalay Bay hotel in Las Vegas in front of a large screen display of my product , the HP 3800 Series switches, was taken by one of my customers. 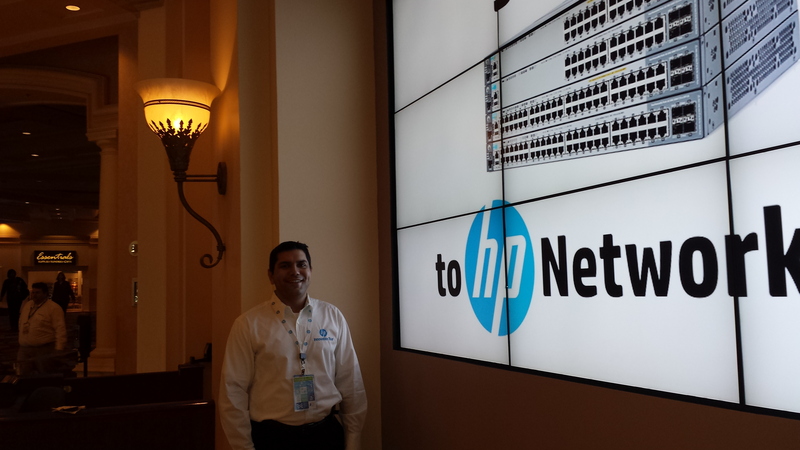 I was at Interop at the Mandalay Bay hotel in Las Vegas last month to meet some customers when, to my pleasant surprise, I had noticed a large screen display on a wall outside the conference in the hotel dedicated to my product, the HP 3800 Series switches. This was outside the entrance to the conference, so anyone in the hotel could see it. I am very proud to say that I am the Global Product Manager for this product at HP. We recently introduced support on this product for two SDN applications – Network Protector and Network Optimizer for Microsoft Lync. You can find out more about the HP 3800 Series switches here.